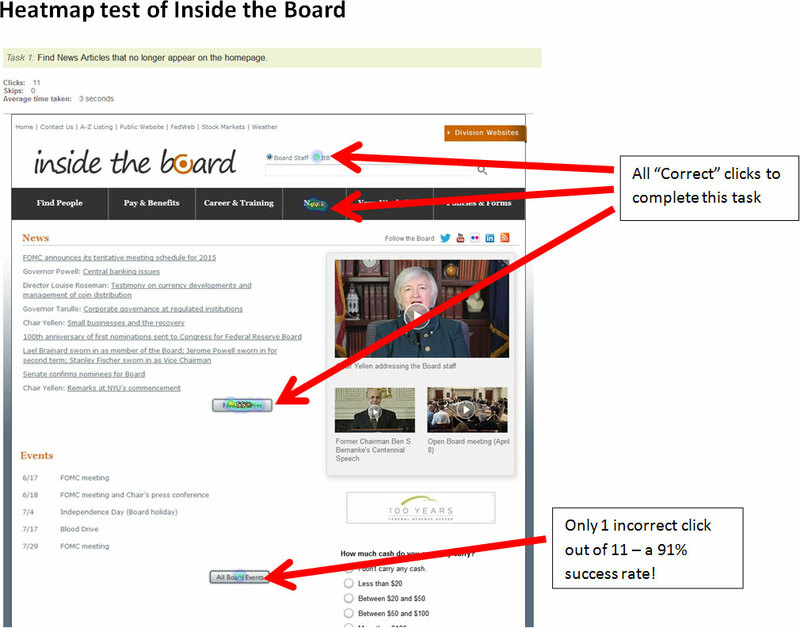 In 2012, the Federal Reserve Board used the Top-task methodology to redesign our intranet, called Inside the Board, which had not been significantly updated since it was launched in 1995. After determining the top tasks the audience needs to accomplish on a website, you can run usability tests to gain knowledge and improve the site. The project was wildly successful. 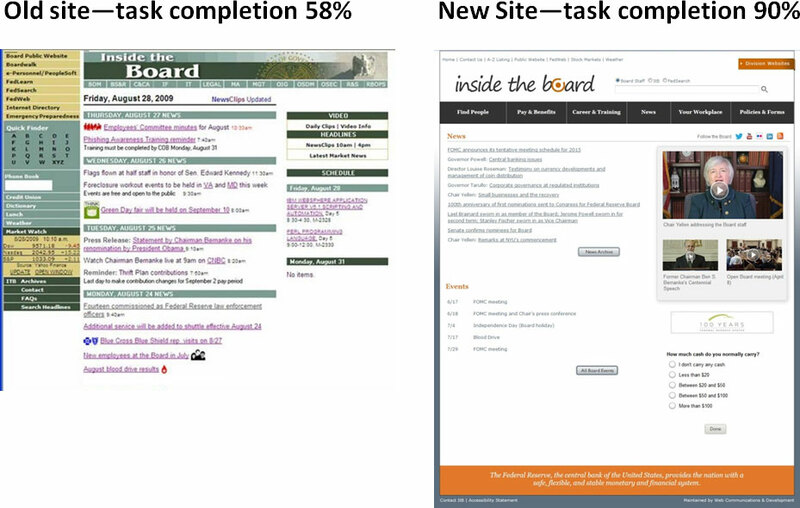 Task completion ratings rose to more than 90% after the redesign, from 58% on the legacy site—drastically increasing the productivity of the Board’s employees. 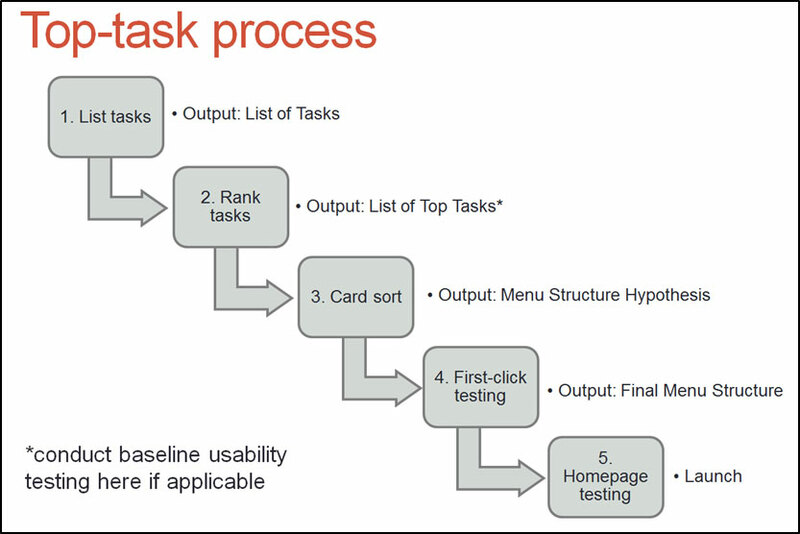 Top-task methodology is a simple, 5-step process that makes it as easy as possible for users to complete the tasks that are most important to them. To begin, you sit with the client and go through the website together, listing every task that can be done on the site. 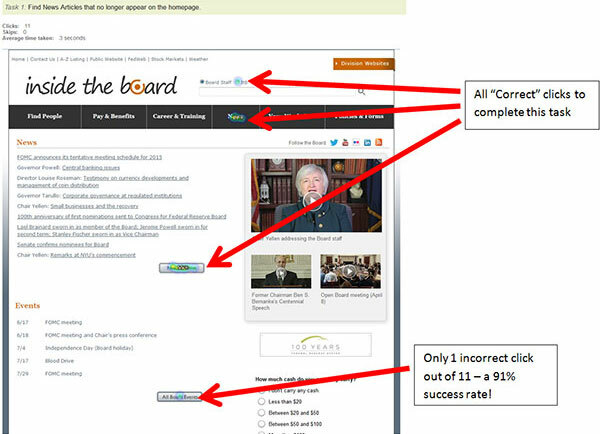 Examples are Register for a seminar, Find a staff member, Read news articles, and Submit a comment. It’s important to keep the list of tasks to less than 100. Combine similar tasks together, if necessary. Send a one-question survey to your entire user base (or a representative sample, if necessary), asking each user to choose the 5 tasks that are most important to them. Then ask them to rank those tasks in order of importance from 1-5. Weigh the answers to give 5 points to each #1 choice, 4 points to each #2 choice, etc. 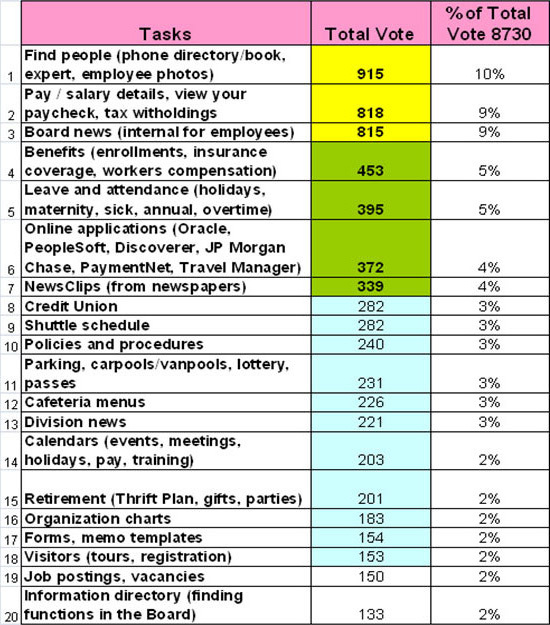 Your result will be a weighted list of tasks in order of importance to your users. The survey only takes the user about two minutes to complete. 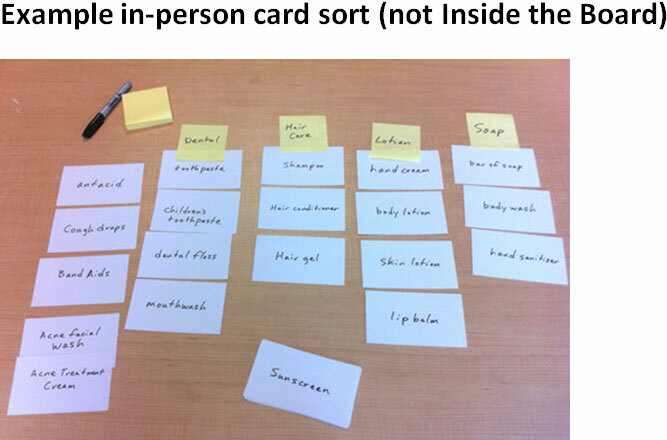 Using either in-person or online card sorts (we like to use online sorts), present the top 30-50 tasks to your users, each on a separate card. 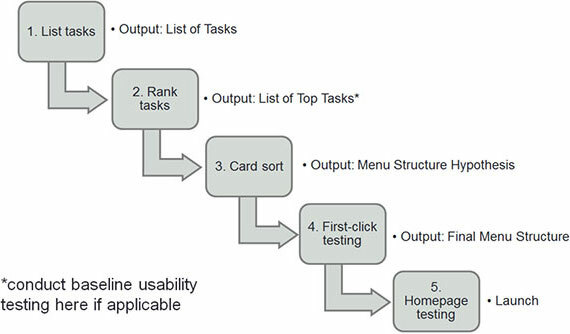 Ask the users to group those tasks together into “buckets” that make sense to them. Typically, 4-8 buckets are customary. Then ask the users to name each bucket they created. This step begins to form what we call your menu structure hypothesis. 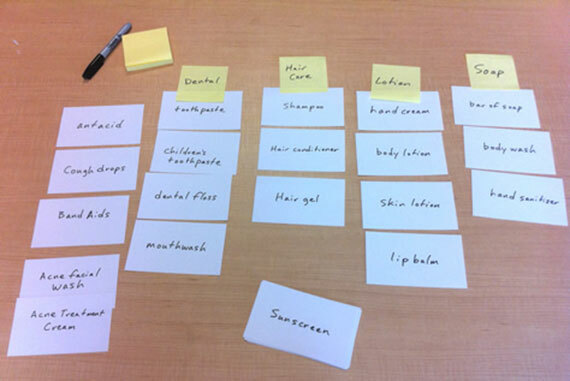 Now it’s time to test the menu structure hypothesis you just created in your card sort. To do this we utilize first-click testing, where you present a real world task to a user, such as Register for an upcoming Microsoft Excel training course, and ask them to choose which bucket in your hypothetical menu structure they would click on first to complete the task. Your goal is to have at least an 80% first-click success rate. We typically test about 15 tasks, including at least 1 for each proposed bucket of the menu structure. 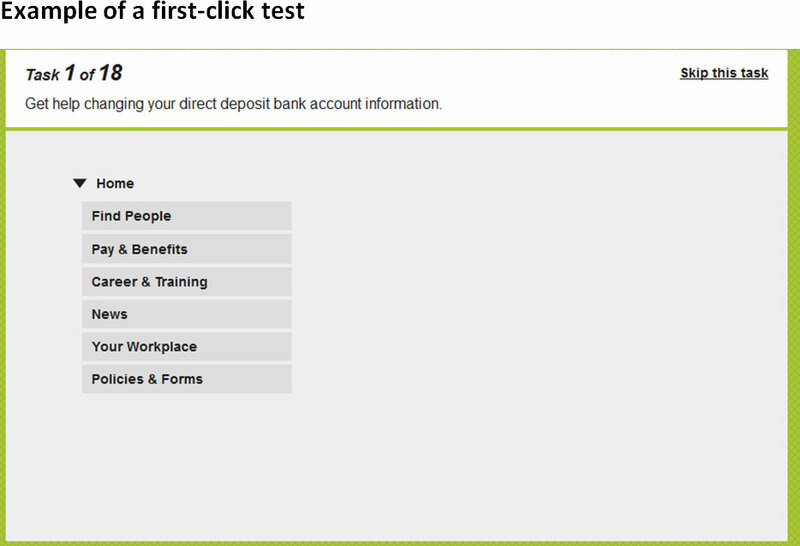 The test only takes the user about 5 minutes to complete. It may take you 2 or 3 rounds of testing slightly different hypotheses to reach 80%. 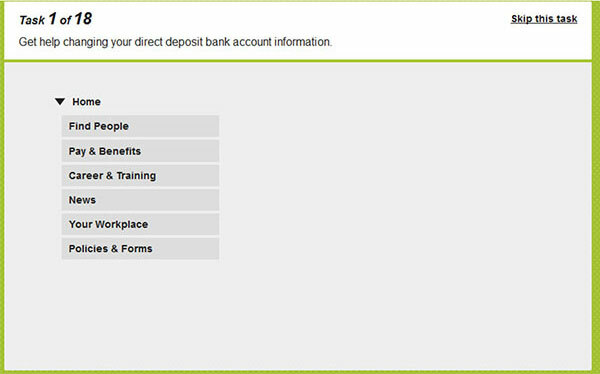 Once you do, you can be confident you have a menu structure that the vast majority of your users will be happy with. Finally you’re to the point where you can mockup a full-color representation of your homepage. In this step, you repeat your first-click tests with a new set of testers, and this time with your mockup. The goal here is to make sure your homepage design is intuitive to users and is leading them to click in the places where they need to click in order to successfully complete their tasks. This type of testing is also known as heatmap testing. Again, you’re aiming for at least an 80% first click success rate. One of the great things about this process is how repeatable it is. As we know, websites, particularly government websites, are not static. They continually change. You can repeat this entire 5-step process every 18-24 months to make sure the menu structure of your website is still working well for your users. The top-task process is easy to learn, execute, and repeat. It involves your users at every step of the way to create a website that features a menu structure your users will find intuitive and easy to use. In short, it helps your users complete the tasks that are most important to them in the shortest amount of time, leading to happy users and happy clients!Ben Rosset, PMP is the Accessibility Project Manager at the Federal Reserve Board. 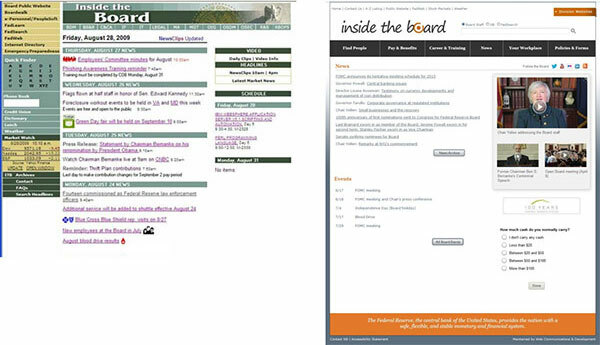 Editor’s Note: If you’d like to know more about top-task methodology and/or want to learn about the tools Ben and his team used to redesign “Inside the Board,” please register for the upcoming webinar, “Using Top Tasks Analysis to Make Your Site Usable,” where Ben himself will delve deeper into the Federal Reserve Board’s comprehensive UX analysis. For more information on usability testing, visit the DigitalGov User Experience Program page or join the User Experience Community of Practice.